One of my end of year rituals is finding and posting the years’ best videos. Given my current interest in maker education, I decided to locate and post 2015 videos related to maker education, STEM, and STEAM. At Albemarle County Public Schools, maker education fosters student autonomy, ignites student interest, and empowers students to embrace their own learning. We are all makers; it’s in our DNA. Featuring President Obama, Dale Dougherty, Adam Savage and others. The Adaptable Mind explores the skills we need to flourish in the 21st Century. Since those early Maker Faires of 8-bit Arduinos and 3D printers much has changed, from the the wide availability of powerful smartphone-class electronics to the rise of polished crowdfunded campaigns. So what’s now at the DIY bleeding edge? 3D technology is changing the world for kids born without limbs. Computer science is a foundational field that opens doors for all boys and girls. Starring Sheryl Sandberg, Jasmine Lawrence, Karlie Kloss, May-Li Khoe, Mia Epner, Alice Steinglass, Jess Lee, Paola Mejía Minaya, Malala Yousafzai, and Susan Wojcicki. In a world where knowledge has become a free commodity, one skills set is vital to guarantee our students and our countries a healthy and prosperous future. It is the capacity to solve problems creatively – in a word, to innovate. The world is malleable and everything in the made world is designed. Mount Vernon Innovation Diploma leader Anya Smith inspires our sense of agency and creative confidence, and she provides her recipe for success in taking on and tackling problems to make a positive difference. Just as the Maker Movement is transforming our culture, it’s having a major impact in our schools. This episode of iQ: smartparent examines the Maker Movement’s impact in the classroom. Playing with Legos for the first time without instructions – they’re reactions are priceless. What did you learn when you played as a child? 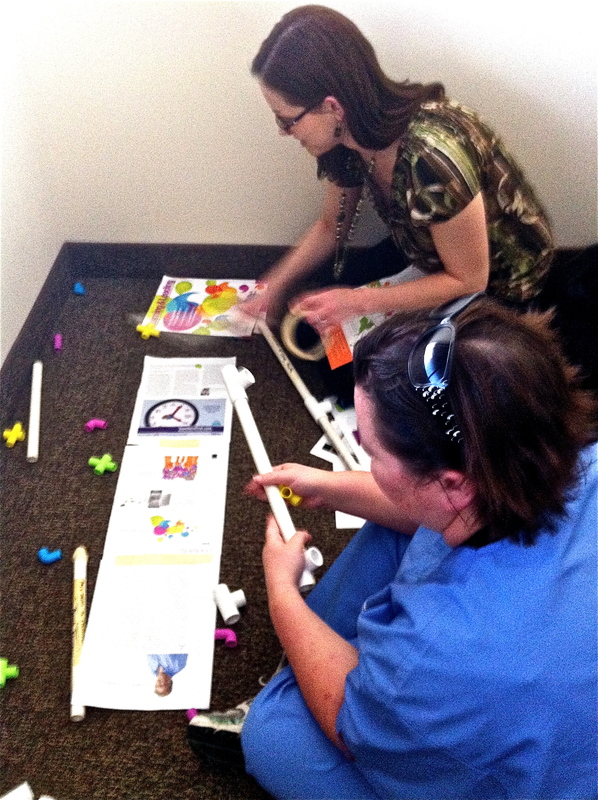 Susan shares the idea of how play is making learning successful at the Museum Center for Learning and Opal School. A Lego commercial that encourages girls to keep building. The 2015 Rube Goldberg Machine college nationals contest . . . the challenge: erase a chalkboard in the most whimsical, over-elaborate way possible. What if all the action heroes were girls? All girls deserve to see themselves as heroes. One of the greatest gifts a teacher can give learners is the opportunity to tell their stories, and to establish venues to have those stories witnessed by others. There is a movement among pockets of educators to make education a passion-based process of learning. John Seely Brown noted how technology can ignite learners’ passions. Diane Rhoten stresses that learning should be interest-driven, that learners should create narratives that they find personally motivating, personally relevant, personally interesting using digital media tools to tell their stories. Providing learners with the tools, skills, time, and venues to tell their stories creates a powerful strategy for tapping into learner passions. It also utilizes the tools and learning strategies they are using during their out-of-school time. This is stressed in a new ebook by ithemes media, Kids Creating Stuff Online: Inspiring the Innovators of the Future. Let’s face it: everything is online, even our kids. The Internet is no longer something people figure out when they get old enough. Many kids are growing up with laptops and tablets. They have cell phones that can do more than most computers of the past. Kids need to take the opportunity to embrace the online world and create a positive digital footprint. Instead of freaking out— “Won’t someone think of the children? !”—we should see this as an opportunity. Kids and teens are interested in the Internet and the online world, so let’s make the most of it. This isn’t a how-to post. It provides a rationale for educators to facilitate having their learners (all ages) create a video of something for which they have passion and create a venue for students sharing those videos with a global audience – Youtube, Blogs, wikis. The videos would become a type of Ted Talk. 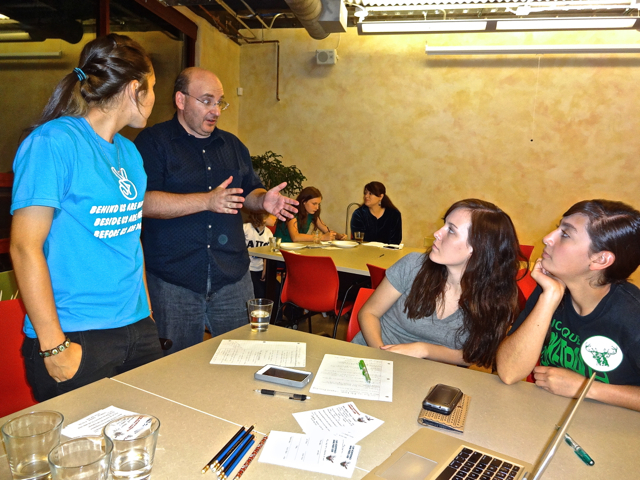 Karl Fisch facilitated this process with a group of high school students. Theme: You will use “What Matters (to You)?” as your ‘essential question’ to explore for your own talk. Essentially, you will select a topic based on something that truly “matters” to them and craft video about that topic (6 minutes or less). Small Talks is a new website (under development) that provides educators with resources to assist students in researching, writing and recording their own lectures on subjects they’re passionate about. When they are ready they can be uploaded for others to see. Live or videotaped instructional videos, where students teach others the skills acquired. A pitch for a new invention or process: the learner presents ideas for a new invention with the audience providing recommendations and positive feedback. In this standards driven world, educators might argue that they do not have the time to do such a project with students. I could easily identify the content-area standards addressed with this assignment – language arts, oral communication, visual arts, technology skills. The more important outcomes, in my perspective, of such a project are increased confidence, development of self-regulation skills, enhanced sense of personal identity, and increased feelings of significance – that they have been been seen and heard. 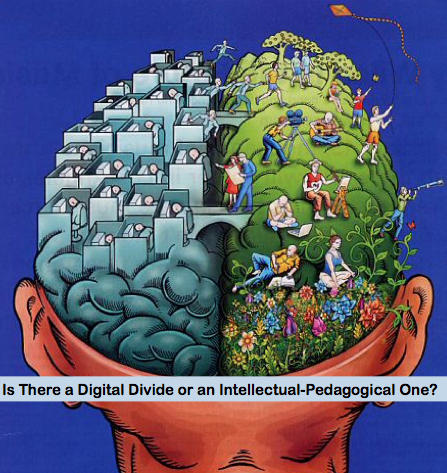 Is There a Digital Divide or an Intellectual-Pedagogical One? This post includes a number of wonderings . . .
For the past few days, there has been some controversy over a TED talk that included some commentary about classism. See the Time article Was Nick Hanauer’s TED Talk on Income Inequality Too Rich for Rich People? for a synopsis. The basic premise was that the talk was censored from public viewing due to it being offensive to the wealthy folks that pay to attend the TED conference. I really love watching TED talks but this controversy got me thinking about intellectual elitism. I cannot nor will ever be able to afford to go to a TED conference but I can watch them online. I often ask, in group settings, if folks heard of TED. Groups that contain higher education faculty and teachers, who are engaged in social networks, do know of TED talks. My college students and friends, many who are of lower SES levels, have not. I wonder what would happen if I were to ask this question of the larger population. I believe the results would show that more higher income folks would know about the TED talks than lower income folks. I have the privilege of using my laptop, iPhone, and iPad to learn about anything I want throughout the day. These devices along with skills I gained about how to learn have provided me with opportunities to access information I desire. I am wondering if folks from lower income brackets can say the same. The use of technology use by our society has sparked discussion about the digital divide. But I wonder if the digital divide is really an intellectual or pedagogical one. I wonder that if a comparison was done of higher and lower income schools, what would be the ratio of 1:1 (one mobile device per student during school time) initiatives? I wonder, for those lower income schools, how many students have computer devices at home that match those they are using in school. Even considering the new Ted-Ed Lessons Worth Sharing, I wonder which schools are using the lessons. I wonder if technology integration strategies are similar for higher income schools in comparison to lower income skills. It’s no surprise that schools in wealthy communities are better than those in poor communities, or that they better prepare their students for desirable jobs. It may be shocking, however, to learn how vast the differences in schools are – not so much in resources as in teaching methods and philosophies of education. I fear that the digital divide is really an intellectual and pedagogical one and that it is being perpetuated in our educational system by the use or lack thereof of the technologies that are influencing and driving our society-at-large. Is the Educational Revolution About Videos: Ted-Ed and Khan Academy? Prior to going into my critique of this so-called educational revolution, I am giving this disclaimer, I love TED and love the videos being produced by Ted-Ed. The point of learning is not just to know things but to be a different person – more mature, more wise, more self-disciplined, more effective, and more productive in the broadest sense. In the flipped classroom, as it is being discussed, the videos, instead of a live teacher, are at the core of the learning process, become the venue for the didactic presentation. The explanation of the flipped classroom provided on the Ted-Ed website . . . The [flipped classroom] refers to a method of instruction where classroom-based teaching time and traditional “homework” time are reversed (flipped). A teacher provides video lessons to be reviewed outside of class, which in turn gives teachers more time in class to focus on higher-order learning skills. The TED-Ed website has a suite of tools that allow teachers to design their own web-assisted curricula, complete with videos, comprehension-testing questions, and conversational tools. The Think and Digging Deeper questions are, I assume, prompts or guides for the higher level thinking. The use of lectures, quizzes, and questions to teach and for students to demonstrate learning is a Eurocentric, consumption-based model of education. There is value in linguistic-oriented and Socratic method (adding reflective questions and discussion) of teaching but it does not honor learning-by-doing. Tinkering and experimenting; engaging in the arts; going out into the community; tapping into students’ talents, interests and passions are not part learning process. Harvard Professor Chris Dede believes of the flipped classroom . . . I think that the flipped classroom is an interesting idea if you want to do learning that is largely based on presentation. You use presentation outside of the classroom. 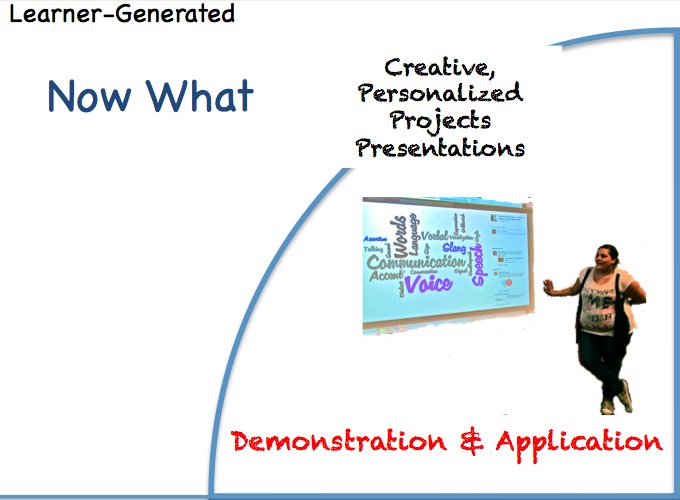 Then you do your understanding of the presentation and further steps from the presentation inside the classroom. I think it is a step forward. It is still, in my mind, the old person. It’s still starting with presentational learning and then trying to sprinkle some learning-by-doing on top of it. 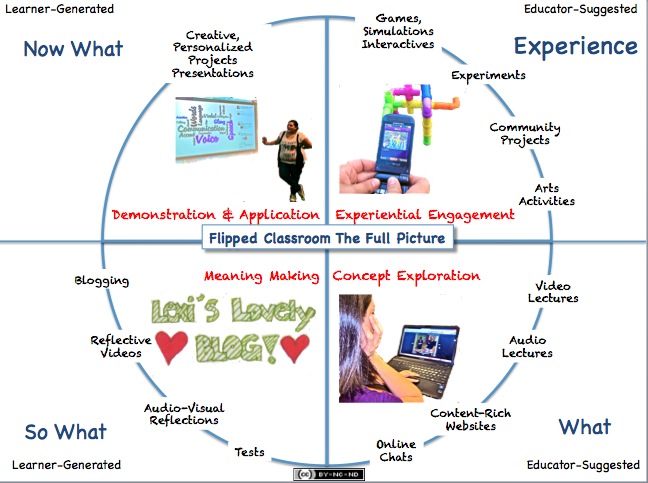 I am interested more in moving beyond the flipped classroom to learning by doing at the center than a kind of the intermediate step that still centers on largely on tacit assimilation (https://usergeneratededucation.wordpress.com/2011/11/20/flipped-classroom-full-picture-an-example-lesson/). I proposed The Flipped Classroom: The Full Picture as a way to get educators’ attention given the press this model is receiving. I did so in an attempt to encourage educators take the resources and opportunities that technology (including the use of videos) affords to truly create a learning revolution, one that is constructivist, student-centric, hands-on, and passion-based. So are Sal Khan and Ted-Ed initiatives really going to disrupt education, create a learning revolution? It sounds a bit like Thomas Edison’s thoughts about how film would change education. I do see a use for high production, high interest videos but to support a student’s learning not to direct it. There is where the flipped classroom and the Ted-Ed, Khan, and other videos have value – to reinforce and add to a student’s learning – not be central to it. TED is about ideas worth sharing. I am curious if the kids, after being directed through the Ted-Ed lessons, will develop and spread their own ideas with their peers. Flip your instruction so that students watch and listen to your lectures… for homework, and then use your precious class-time for what previously, often, was done in homework: tackling difficult problems, working in groups, researching, collaborating, crafting and creating. Classrooms become laboratories or studios, and yet content delivery is preserved. Flip your instruction so that students watch and listen to your lectures… for homework, and then use your precious class-time for what previously, often, was done in homework: tackling difficult problems, working in groups, researching, collaborating, crafting and creating. Classrooms become laboratories or studios, and yet content delivery is preserved (http://www.connectedprincipals.com/archives/3367). Lectures become homework and class time is used for collaborative student work, experiential exercises, debate, and lab work. Extends access to scarce resources, such as specialized teachers and courses, to more students, allowing them to learn from the best sources and maintain access to challenging curriculum. Enables students to access courses at higher-level institutions, allowing them to progress at their own pace. It is important, though, not to be seduced by the messenger. Sal Khan is very charismatic and has produced good videos to explain some complex mathematical concepts. With the growth of open education resources via Youtube and Creative Commons, it is important to note that excellent video lectures have been and are freely/easily available. The Flipped Classroom concept, though, was not developed and articulated by Khan but by teachers such as Karl Fisch and Jon Bergman/Aaron Sams. In other words, the message being given is that teachers can do what they want to during class time. Now educators have time for engagement and interaction with the learners (#EdCampChicago presentation). A major roadblock or barrier to the implementation of this model is that many educators do not know what to do within the classroom, what to do with that “whatever they want to do” time. For educators, who are used to and use the didactic model, a framework is needed to assist them with the implementation of the Flipped Classroom. In other words, the message to teachers to do what they want during classroom is not enough to make this transition. 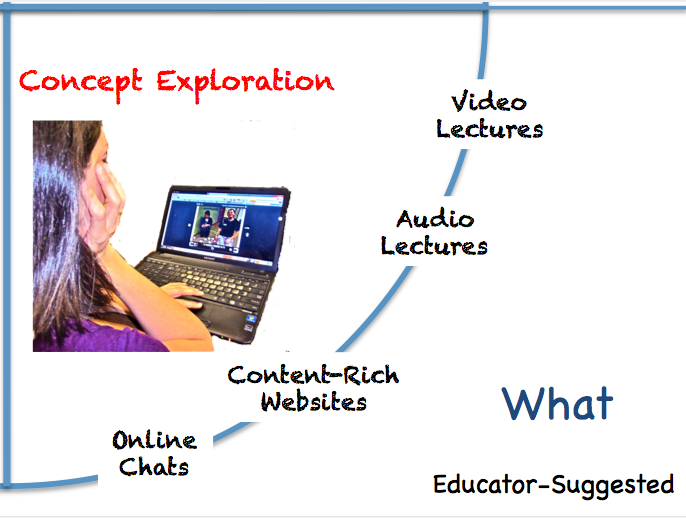 In order to minimize the flavor of the month syndrome (recall character education, phonics movements, multicultural education, Reading First, powerpoints in the classroom), the use of video lectures needs to fall within a larger framework of learning activities – within more establish models of learning, providing a larger context for educator implementation. What follows is an explanation of the Flipped Classroom Model, a model where the video lectures and vodcasts fall within a larger framework of learning activities. (Note: I am titling it the Flipped Classroom Model to get folks’ attention given the Flipped Classroom popularity right now. It really is a cycle of learning model.) 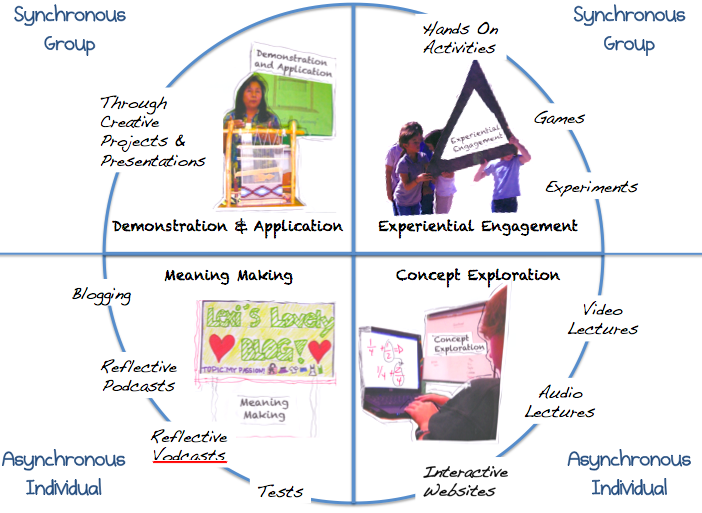 It provides a sequence of learning activities based on the learning theories and instructional models of Experiential Learning Cycles – http://reviewing.co.uk/research/learning.cycles.htm and Bernice McCarthy’s 4MAT Cycle of Instruction- http://www.aboutlearning.com/what-is-4mat/what-is-4mat. The cycle often begins with an experiential exercise. 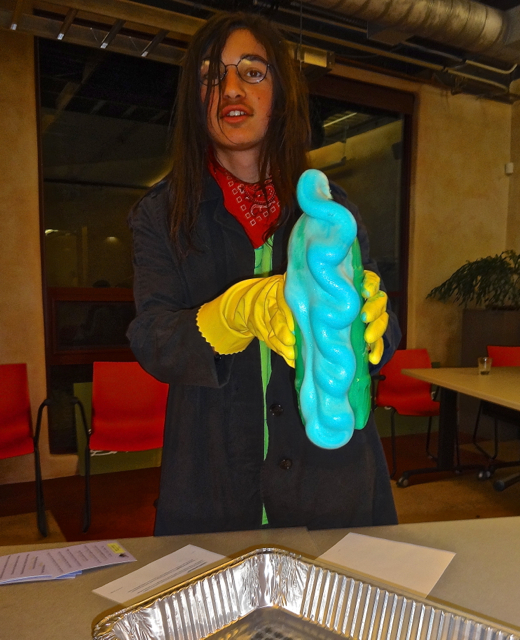 This is an authentic, often hands-on learning activity that fully engages the student. It is a concrete experience that calls for attention by most, if not all, the senses. According to McCarthy, learning activities are designed that are immersive. Learners “experience the now.” They become hooked through personal connection to the experience and desire to create meaning for and about that experience (ala constructivist learning). Students become interested in the topic because of the experience. They have a desire to learn more. This is in line with John Dewey’s thinking regarding experience and education. The nature of experiences is of fundamental importance and concern in education and training. People learn experientially. It is the teacher’s responsibility to structure and organize a series of experiences which positively influence each individual’s potential future experiences (http://wilderdom.com/experiential/elc/ExperientialLearningCycle.htm). 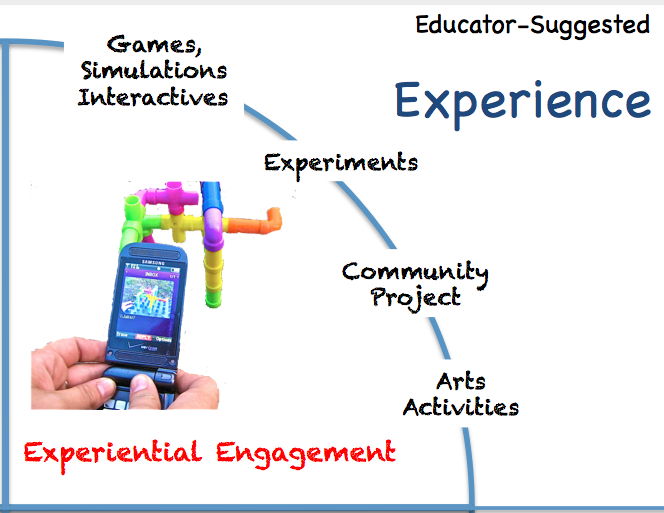 Examples of Experiential Engagement include Experiential Learning Activities, Science Experiments, Simulations, Games and use of the Arts. 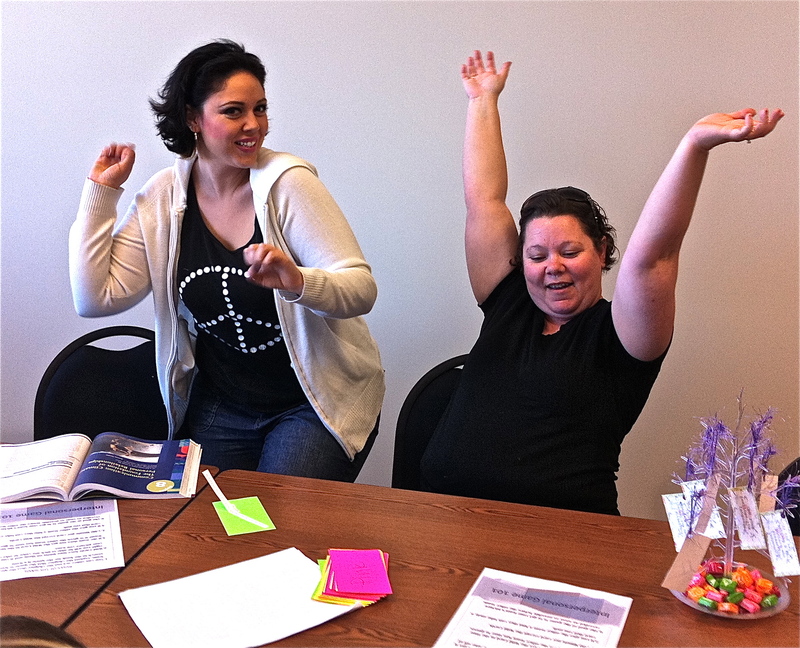 Setting: These activities are designed for in-class time and often occur in a group setting. 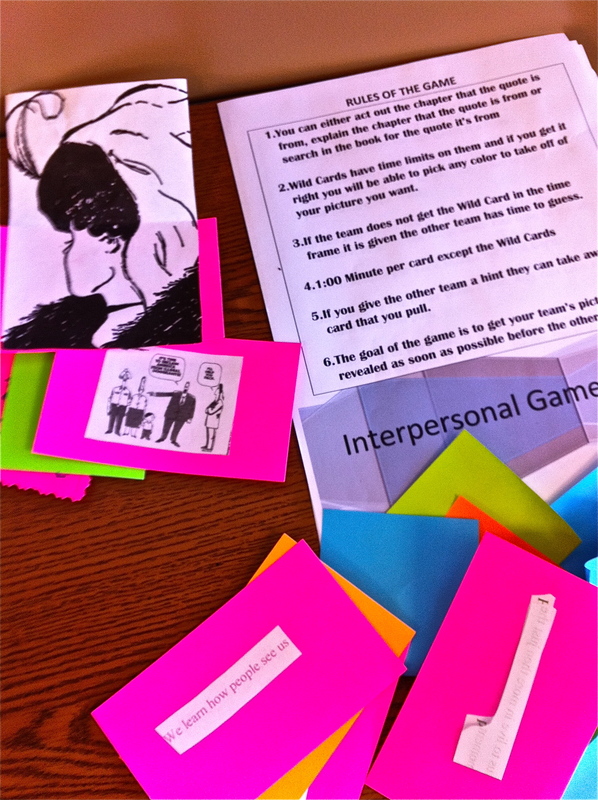 In a blended course, these are synchronous activities conducted during face-to-face instructional time. In an online course, students could be asked to go to a community event, museum, . . or the creative educator could provide some type of hands-on activity or simulation for students to complete during a real-time synchronous webinar session via Adobe Connect, Elluminate or through a 3D Learning experience such as Quest Atlantis. Learners are exposed to and learn concepts touched upon during Experiential Engagement. They explore what the experts have to say about the topic. Information is presented via video lecture, content-rich websites and simulations like PHET and/or online text/readings. In the case of the flipped classroom as it is being currently discussed, this is the time in the learning cycle when the learners view content-rich videos. This is where and when videos such as those archived by Khan Academy, Neo K-12, Teacher Tube, or other video services are used to help students learn the abstract concepts related to the topic being covered. McCarthy reinforces that concepts should be presented in accessible form. By providing learners with online resources and downloadable media, learners can control when and how the media is used. This is the major value of flipping the classroom . . . content-based presentations are controlled by the learner as opposed to the lecturer as would be the case in a live, synchronous, didactic-driven environment. In a user-generated learning environment, students could be asked to locate the videos, podcasts, and websites that support the content-focus of the lesson. These media can then be shared with other students. Part of this phase includes an online chat for asking and addressing questions about the content presented via the videos, podcasts, websites. Through a “chat” area such as Etherpad or Google Docs, learners can ask questions with responses provided by co-learners and educators. Videos could even be embedded into a Voicethread so students can post comments/reactions to the content. Obviously, in a face-to-face setting, students can bring their questions into the real time environment. Setting: These materials are used by the learners in their own setting on their own time. In other words, students have the opportunity to access and interact with these materials in a personalized manner. They can view them in a learning setting that works for them (music, lighting, furniture, time of day) and can view/review information that they find particularly interesting or do not understand. It is asynchronous learning and as such permits the learner to differentiate learning for him/herself. Learners reflect on their understanding of what was discovered during the previous phases. It is a phase of deep reflection on what was experienced during the first phase and what was learned via the experts during the second phase. Learners can articulate and construct their understanding of the content or topic being covered through written blogs or verbal-based audio or video recordings. Within the standard school system, this would be the phase when students are tested about their understanding of the content. If this is the case, it is recommended that the tests target higher levels of Bloom’s Taxonomy – evaluation, applying, synthesizing. Setting: If possible, learners should be given the opportunity to reflect upon and make meaning of the content-related concepts within their own time schedule . . . both at a time when they feel ready to do so and taking the time they personally need for producing self-satisfactory work. Setting: This phase of the cycle is best when it occurs in a a face-to-face, group setting within the classroom. The reasons for recommending this type of synchronous learning are (1) the educator can guide the learner to the types of projects and tools best suited for him/her, and (2) an audience of peers and mentors increases motivation and provides opportunities for feedback. Obviously, in an online course, students can work on their projects and present them to peers/educators during a synchronous, interactive online forum. Goal of Unit: Identify and analyze strategies for using language more effectively. Students participated in the Mine Field and Bridge-It experiential exercises. Students blogged about what they learned comparing the in-class experiential activity with their text readings and video viewings. We broke into groups of three and were asked to create one side of a bridge within our group to connect to the others groups bridge. We were in two separate rooms, with the same supplies and could only communicate with one member of the other group at a time, every five or so minutes. I was the communicator for my group. This was extremely hard trying to build the same thing as someone else in a totally different room. As the project moved further along, people began to get frustrated and irritated for different reasons. 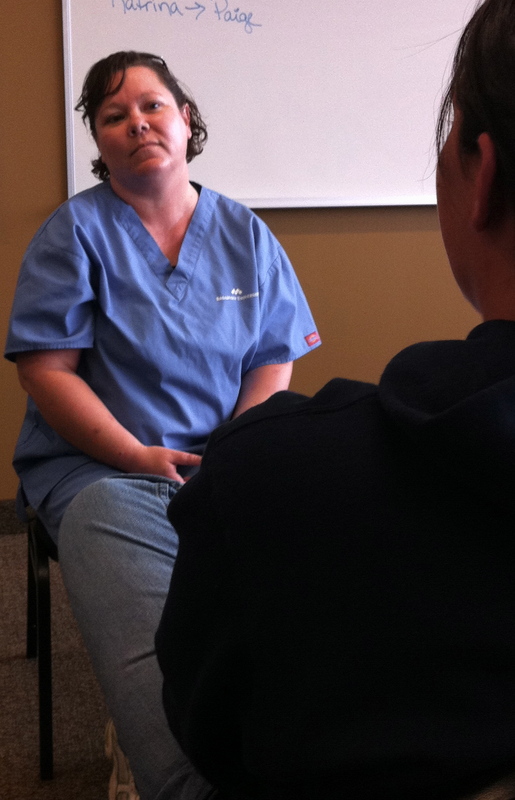 Even though it was successful as far as the construction, many of us left class upset and frustrated. In the readings I read “the process of constructing meaning is itself symbolic because we rely on words to think about what words and other things mean” (Wood, 2010, p. 100). I think this is so true and it was evident in our project. Each team was relying on the words of the other team to determine the explanations of the bridge construction. To clarify, without our ability to SEE the other group’s project, we had to solely depend on words. Words are discussed as never being self-evident or absolute (Woods, p. 100). With each person’s individual perspectives, we assign individual and unique meanings to words. In that process, we unintentionally open the doors to misinterpretation. As Woods describes, language defines, evaluates, organizes, allows hypothetical thought, and also allows self-reflection (Woods, p. 103-107). 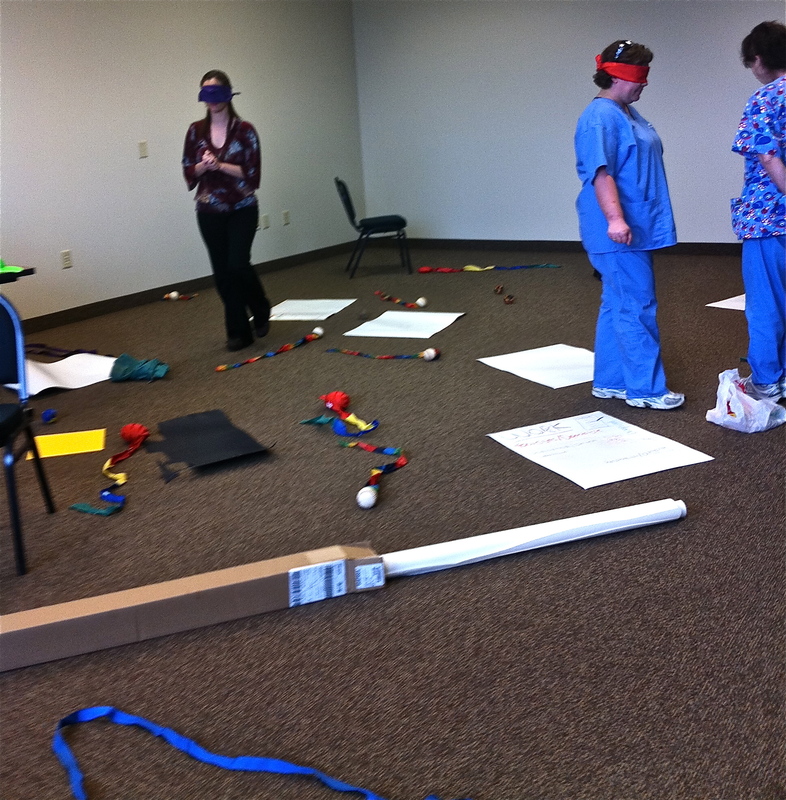 The key roles witnessed during this activity were the organization of perception, hypothetical thought, and evaluation. Mainly these were present between each group’s communicator to the other group, but they also trickled down to the communication within the groups as information was passed along; much like a chain of events. The power of verbal language is almost jarring. 1) Students demonstrated what they learned through in-class listening exercises. 2) Then learners selected listening skills they decided to practice in real life. They reported on their results through blog entries. When it comes to pseudo listening, it seems like for the most part there were just too many distractions or barriers going on. I found myself wanting to listen to people around me, but I couldn’t turn the internal dialog off. So throughout the week I tried to catch myself, and found that it wasn’t too hard. Most of this type of non-listening occurs when I’m on the phone (particularly with my parents) for a long period of time. I’m not very good at talking on the phone anyways because of the lack of eye-contact and my distractions caused by trying to multi-task. The best results in correction my pseudo listening were to go and sit in a quiet area (have a smoke) and literally sit on my free hand. If my mind still wandered, I fought to catch myself and redirect my attention to who I was speaking with on the phone. 3) Finally students integrated their course learning through a celebration of learning. 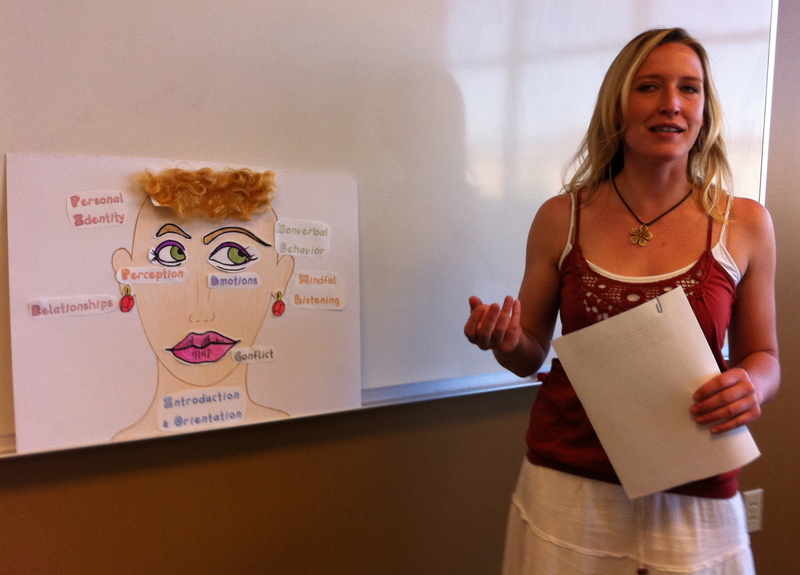 They created metaphors for the course content, and explained personal learning and future applications via these metaphors. 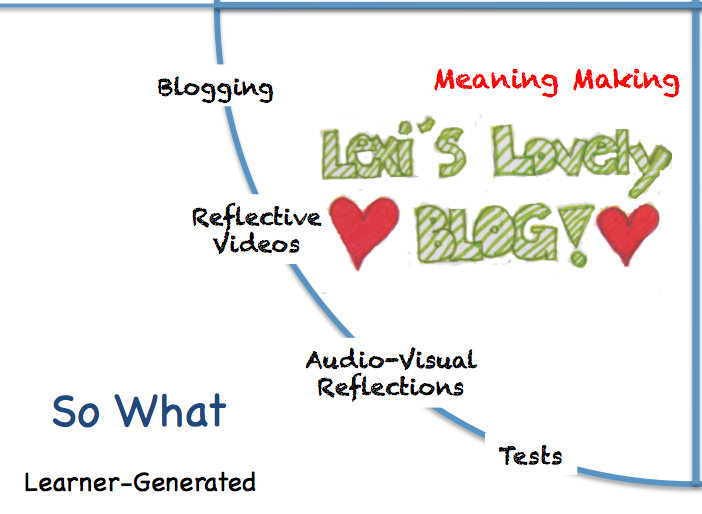 Final Note: The title of my blog is User-Generated Education. I have a goal of assisting with educational reform in that a learner-centric system of education evolves. I believe that this cycle of learning is a natural way of learning and that educators can assist students in understanding this cycle so they can use it for their own personalized learning experiences. Education scientist Sugata Mitra tackles one of the greatest problems of education — the best teachers and schools don’t exist where they’re needed most. In a series of real-life experiments from New Delhi to South Africa to Italy, he gave kids self-supervised access to the web and saw results that could revolutionize how we think about teaching (http://www.huffingtonpost.com/tedtalks/sugata-mitra-the-child-dr_b_708043.html). “If the world belongs to our children then why don’t we just give it to them” was the title of Sugata Mitra’s talk at the Big Ideas Fest during the opening of the conference. According to Dr. Mitra, Of the 1 billion children on Earth. 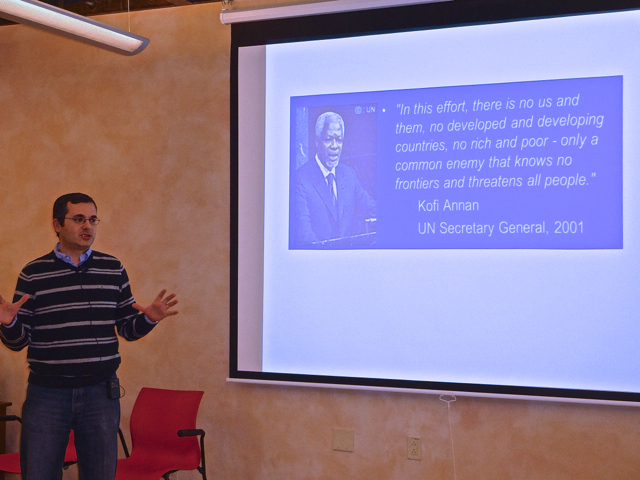 750 million have inadequate resources. You can drive children with questions. You don’t have to give them the answers. They can find the answers. If the kids/students didn’t get the “right” answer, then teacher didn’t ask the right question. The teacher needs to change question. Could Tamil- speaking children in a remote Indian village learn basic molecular biology in English on their own? Could a friendly mediator with no knowledge of the subject improve the performance of these village children? How would the learning and test scores of these children in a remote village compare with those of children who were ﬂuent in English and taught by subject teachers in a local state government school and those attending an affluent, private urban school? Kalikuppam experiment , were published by the British Journal of Educational Technology. What are the limits that children can learn in self-organizing systems? Dr. Mitra would like to find out . . .
More about Sugata Mitra and his work can be found at http://sugatam.wikispaces.com/.